Time has proven that Arizona homes investing is a very good long-term idea. Arizona is a truly great place to live. The continued in-migration by people who have come to realize that fact has ensured that real estate values will continue to grow over the long-term. Whether the purchase is for a residence, second home, or for pure profit, every real estate purchase is a sizable investment. The following discussion centers on the for-profit objective, but the comments generally apply irrespective of the base motive. … is a set of statutes/laws that set a fair balance between the rights and obligations of landlords verses tenants. A landlord is required to generally provide a decent place to live. The tenant is required to timely pay the rent and to take care of the property. And there are restrictions on the rental terms and conditions that “level the playing field” both ways. Plus, irrespective of the terms and conditions of any lease, the provisions of the Act apply, and the Act imposes some rather severe penalties on the landlord for certain violations of the Act. Lastly, there are no “rent controls” in Arizona that are found in some other states. 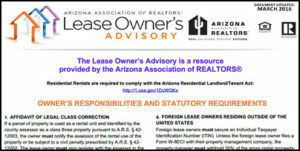 Bottom line … Arizona is generally a good place to own residential rentals. A rental with a positive cash flow is an investment. Since early in 2010, the “investment environment” for SFD (single-family-detached) rental homes in metro-Phoenix has been ideal … a substantial positive cash flow from such investments has been commonly achieved. Historically, for a SFD property purchased with 75% financing, the max with most lenders, the cash for loan payments, maintenance, taxes, etc., has totaled to more than rent paid by the tenant. With the fall in home prices and interest rates, along with an increase in rents, it is common that the rent is more than all costs. In addition to the ongoing positive cash flow, SFD investments also offer tax benefits and long-term appreciation. While the above very profitable investment is possible, done wrong, even in a very favorable environment, it is quite possible to have a negative cash flow. Typically an investment property is going to be 5+ years old and is rarely going to reflect the very latest in style and design. A big mistake is spending significant money to replace somewhat dated components. If the item is fully functional and not damaged, discolored, etc., leave it. respond promptly to genuine tenant issues. The ideal property is a SFD home that has strong appeal for middle to upper-middle income tenants, and be of such quality and nature that an out-of-state owner/landlord can self-manage with near-zero month-to-month involvement. At lower rents, there are a more tenants, but both the tenants and the houses are likely to require a lot more management. At higher rents, the number of tenants decreases dramatically. Rather than a SFD home, what about some form of “attached” dwelling unit? The “numbers” might work, but a SFD home is just a nicer place to live, and therefore easier to market, so the first choice. Living in a residential unit with one or more “common” walls to another dwelling unit, you had better like your neighbors music, and friends, because you are likely going to be listening to them to some extent. What about 4-plexes? With rare exception, the multi-family properties that can be purchased for a reasonable price per-unit are going to be in higher crime-rate areas, and are going to have very low appreciation. The cash flow might be good, and the tenant pool is huge, so extended vacancy is not likely a problem, but evictions and damages likely are. This is a high-maintenance situation, both for the property and the tenants … generally NOT worth the time and effort even with a relatively high ROI. On the other hand, if you have the capital to buy a quality larger multi-family property, these may well produce a strong ROI long-term. The probability of finding a “perfect” property is near zero. The above criteria list is generally in priority order for a rental/investment property. Compromise from the bottom. Starting in about 2008, a tenant applicant with a really good credit score was rare. Some very good applicants went through, or are going through, a short sale or foreclosure of their current residence. We are past the bulk of that activity, but the delinquency still hangs over the credit scores for many. That is often the reason why they are renting rather than buying. They have the income to pay the rent, but cannot qualify for a loan to buy a home. There are also “chronic” renters due to their mindset, lack of a down payment, a concern for future property values and/or anticipation of the need to relocate in the near future. did not disturb the neighbors. … but be a bit concerned that the prior landlord is saying nice things to just get rid of a bad tenant. Absolutely, for sure, talk directly with any prior landlords, but do NOT stop there. In selecting a tenant, it is vital to do sufficient background checks to determine that the probability is very high that the above three requirements are going to be met. The lease must strongly encourage the tenant to take care of the property, and require that the tenant do the minor, ongoing maintenance – like keep the yard free of trash, weeds, and high grass, replace burned light bulbs, and replace A/C air filters. The lease needs to also make clear that the tenant is going to pay any HOA fines caused by tenant actions or in-actions. For higher-cost repairs, also worth considering is to provide a home warranty, but require the tenant to pay the deductible ($50 to $75) for a service call. This has three great benefits … (1) the tenant has a single number to call for any significant issue, (2) that call is NOT coming to you, the landlord/owner, and (3) the tenant is going to think twice about making a call that is going to cost him/her some money. The lease should also make clear that the tenant is responsible for maintaining appliances (fridge, washer, dryer, dishwasher, microwave), and for any damage caused by appliances, even if those appliances are provided by the landlord … in which case, the lease must make clear that the rent does not include extra rent for such appliances, and is not altered if any appliance does not work. The appliances must be in working order at the start of the lease, of course. Size matters, but not much. To most tenants, the first issue with a rental property is the fit to the basic needs … safe area, bedrooms, bathrooms. The next issue in priority is the rent. As long as the basic needs are met, the size of the bedrooms, the square feet of the home, one- verses two-stories and other such “size” issues are of less a concern than the amount of the rent. The “market rent” … within the neighborhood for a property, what is the prevailing rent for homes with the same number of bedrooms? How does the subject property compare in terms of condition and other livability factors? Ideally, the livability of your rental is better to much-better. Adjust accordingly, but not higher than “market” by more than 10%. For good probability of a positive cash flow with 75% financing at an interest rate near 6%, the maximum purchase price that can be paid for an investment property is about twelves times the annual gross rent, the “gross rent multiplier” (GRM). The GRM of 20 in the criteria list is the highest for the “list price” that should be considered, and this only for an ideal property and presuming a lower negotiated price. Even with a lease requiring the tenant to do the routine maintenance plus a home warranty in place, there will be property issues that a tenant will be calling about. To maximize the tenant tenure in the property, thus minimizing the vacancy factor and probably the tenant’s attitude about taking care of the property, such calls need to be responded to promptly. Having a “handyman” on call is a very effective way to deal with these issues, and it is far better to go through the process of finding such a service, and better two or three such services, well in advance of the need.